HRBFYF-102 | Size: 30 ml / 1 fl.oz. The unique formula increases overall lip hydration, volume, softness, and firmness in only one hour after application. Regular use helps visibly define the lip contour area for naturally voluptuous, hydrated and soft lips. Contains a new generation of dehydrated microspheres obtained from Hyaluronic Acid, Konjac Glucomannan powder (Amorphophallus Konjac Root), Marine Atelocollagen and Marine Chondroitin. These microspheres have the ability to penetrate the upper layers of epidermis and to absorb the water that evaporates from the deep dermis. Thanks to their hygroscopic properties offered by the Konjak powder, the spheres volume grows rapidly, about 10 times over, which leads to filling and smoothing the wrinkles while increasing the elasticity and hydration of the skin for a long time. 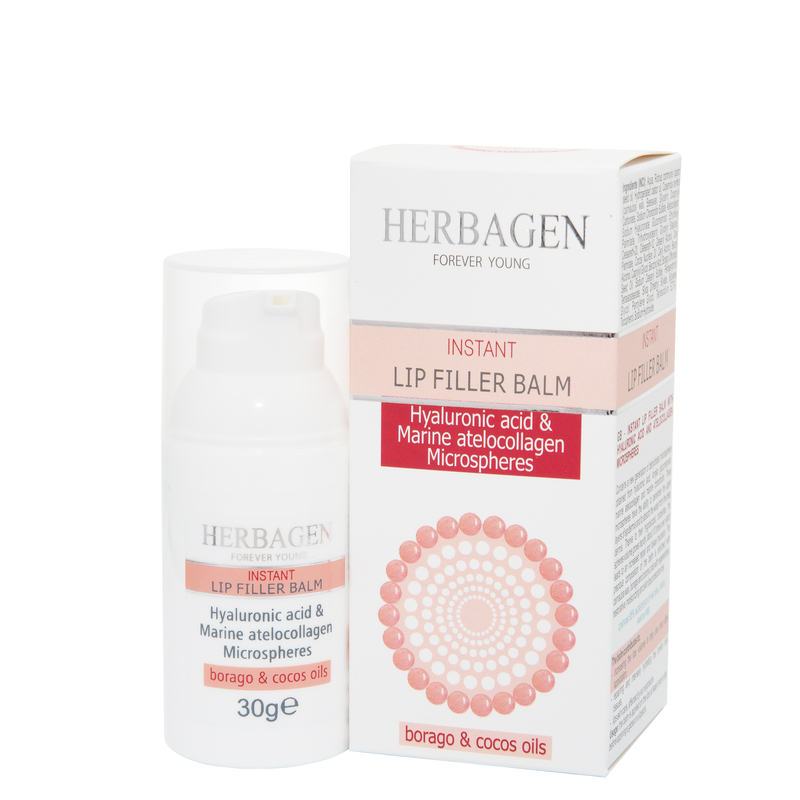 The precious composition of the balm is enriched with Carnauba Wax, Borage and Coconut oils with regenerative, restorative, moisturizing and lips protection role. Usage: Smooth a thin layer over lips and lip area. Use AM and PM. Wear alone or follow with your regular lip products. Smooth a thin layer over lips and lip area. Use AM and PM. Wear alone or follow with your regular lip products. INGREDIENTS: AQUA, RICINUS COMMUNIS (CASTOR) SEED OIL, HYDROGENATED CASTOR OIL, COPERNICIA CERIFERA (CARNAUBA) WAX, BEESWAX, GLYCERIN, DICAPRYLYL CARBONATE, SODIUM CHONDROITIN SULFATE, ATELOCOLLAGEN, SODIUM HYALURONATE, GLUCOMANNAN, ETHYLHEXYL PALMITATE, TRIHYDROXYSTEARIN, GLYCERYL STEARATE ,CETEARETH 20, CETEARETH 12, CETEARYL ALCOHOL, CETYL PALMITATE COCOS NUCIFERA OIL, CETHYL ALCOHOL, BENZYL ALCOHOL, CAPRYLYL GLYCOL, BENZOIC ACID, BORAGO OFFICINALIS SEED OIL, SODIUM CETEARYL SULFATE, PENTAERYTHRITYL TETRAISOSTEARATE, SILICA DIMETHYL SILYLATE, BUTYLENE GLYCOL, PENTYLENE GLYCOL, TETRASODIUM EDTA, TOCOPHEROL, SODIUM HYDROXIDE. Visually revolumizes the face contour.